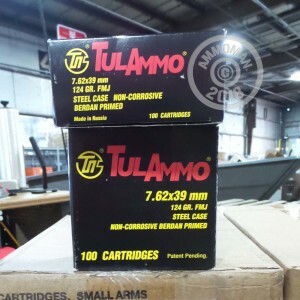 Grab a few of these 100-round boxes of economical 7.62x39mm ammunition from Tula and start blasting away at the range with your favorite SKS or AK rifle. All orders over $99 at AmmoMan.com come with free shipping. Each cartridge in this box fires a 124 grain full metal jacket bullet at 2,330 feet per second. This results in typical ballistics for this caliber and good short to medium range performance. Tula ammo is loaded in Russia using non-corrosive Boxer primers and reloadable brass cases.